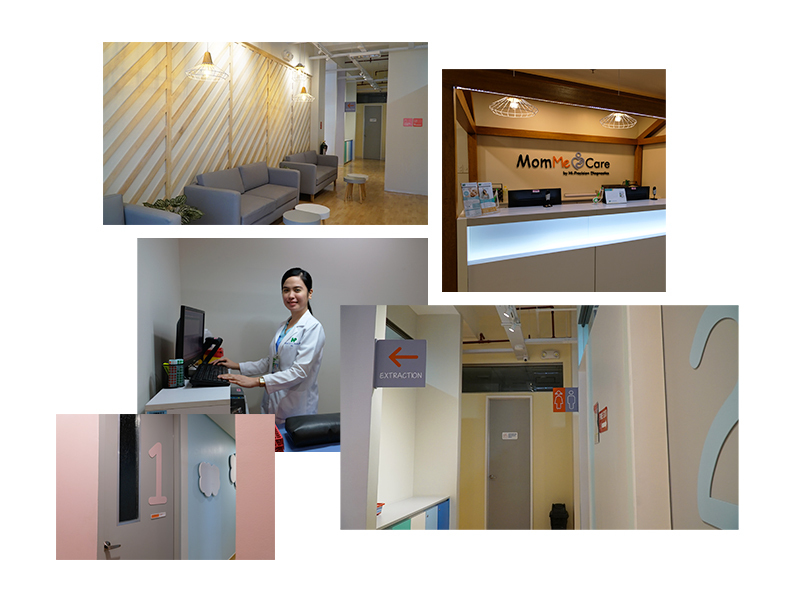 There were two incidents that inspired Melissa Lee, VP for Sales and Marketing of Hi Precision Diagnostics, to build an auxiliary clinic called MomMe Care dedicated for moms and kids. The first incident happened during a trip to Japan when her son got sick. They had to go to a building which was only for pediatrics. The second source of inspiration was her own experience during her pregnancy when she had to undergo a series of blood tests. While in the waiting room, there was a man who was really sick and coughing non-stop. She noticed her own discomfort. Mel shared, “For the first experience, I thought it was really convenient to have a whole building just for pedia. As regards the second, I felt that pregnant women deserve a place for themselves since they need special care due to a lower immune system.” These two moments were the seeds for MomMe Care. “But we have something smaller, a wing of a Hi-Precision branch, and not an entire building,” Melissa added. There are now two branches which opened early this year. One is located at Del Monte in Quezon City, the other at the Alabang-Zapote Road in Las Piñas. Both clinics have obstetricians/gynecologists and pediatricians. 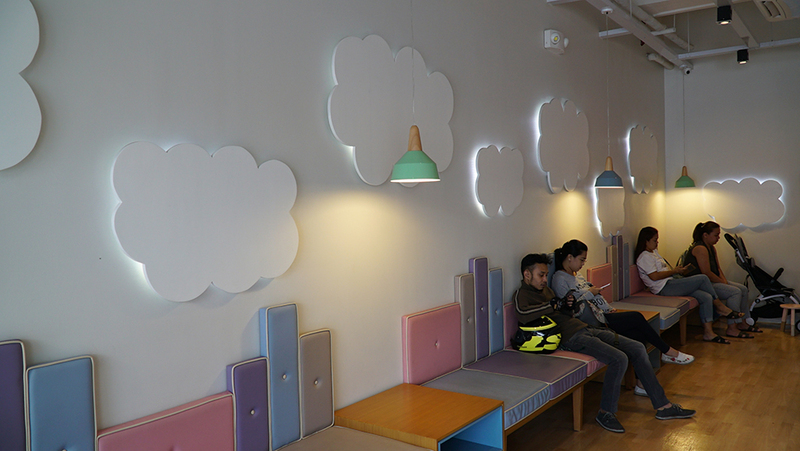 There is also a feeding room available, as well as a nebulizing room and a small area where kids can color books or watch TV while waiting. The colors of the interiors are an interesting mix of pastels. The light and fresh colors create a warm, relaxing and friendly ambience. The waiting room has a lot of comfortable seating areas. The upholstery was done in different colors to complement the hues of the walls. Cut-outs of clouds and trees are a fun way to tease the imagination. You feel that you could be in a friendly garden with nature all around you. The excellent lighting add to the cheerful vibe by making you feel that you were indeed under the sun’s glow. There was another waiting area inside for those who would have to be examined, or needed some private time with her doctor. There was a private breastfeeding room for mothers who were there with their infants. 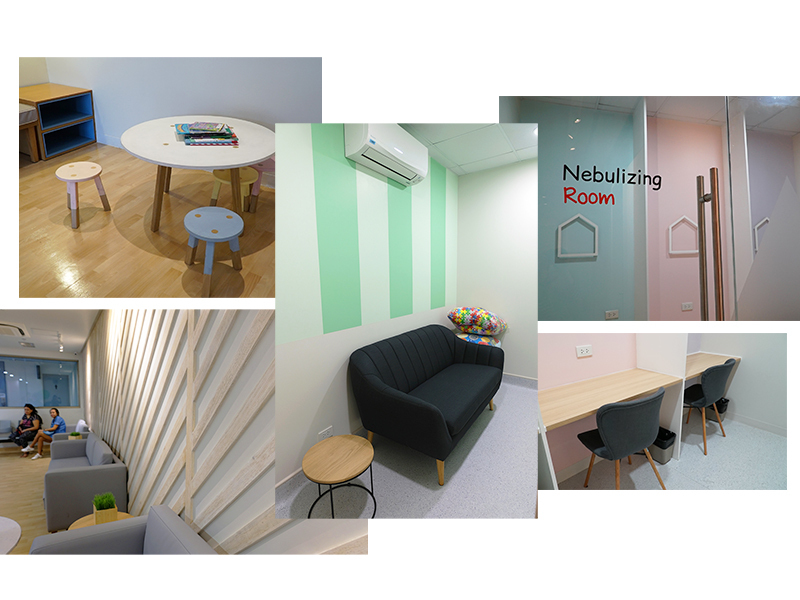 The nebulizer room had several nooks where you had a table (ledge) and chair for each patient. A great deal of thought was also given to creating the signages done in a friendly-looking font. We used Virtuoso paint because of its antibacterial feature. At the same time it has Teflon so that makes it easier for us to keep the walls clean. We created a space that will be relaxing for moms but at the same time fun for the kids. Hi Precision gets a lot of kids and pregnant moms in the branches in Del Monte and Las Pinas, therefore Melissa started MomMe Care here in these two centers. If the current services find resonance, she hopes to expand this service to all Hi Precision Diagnostics branches nationwide.